NEW BRITIAN - An important Thanksgiving rivalry may soon be coming to an end. This season may be the last for the Wishbone Bowl between the New Britain and Berlin football teams. Talks have been ongoing as to whether or not to continue the annual game, which has been played for the past nine years. For Berlin head coach Joe Aresimowicz, however, it’s already a foregone conclusion. But Aresimowicz might be alone in his belief the game is coming to an end after this season. Both New Britain athletic director Len Corto and Berlin athletic director Jeff Mauri say no decision has been made on if the rivalry will continue. Revived in 2009, the rivalry game between the two neighboring programs has led to some exciting moments, especially of late. 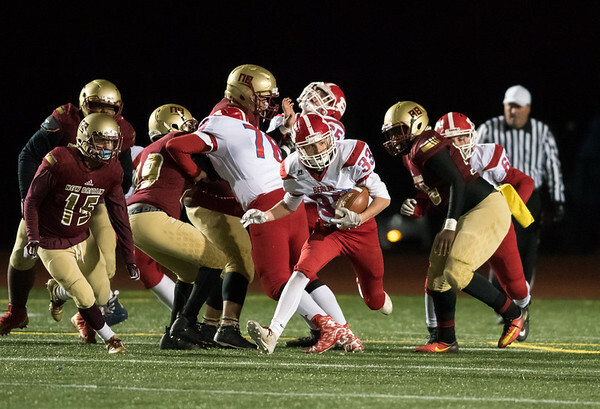 In 2015, the year Berlin was stripped of its wins due to a recruiting scandal leading up the game, the Redcoats came away with a 31-28 win on a final-seconds field goal. Berlin won again in 2016, 28-25, on a Jack Hamel touchdown in overtime. The Hurricanes rolled to an easy 51-6 win last year. Overall, the Redcoats have come away with five of the nine meetings, also collecting wins in 2010-2012. New Britain picked up victories in 2009, 2013 and 2014. The Hurricanes also hold the edge in scoring, 199-169. Under the current structure, the CCC schedules nine of a team’s 10 regular season games, with individual teams negotiating on who they want to play in that final game. But the nearly decade long rivalry doesn’t make sense for Berlin, Aresimowicz said. New Britain is the fourth largest school in the state with a total enrollment of 2,311, including 1,206 boys, whereas Berlin is the 72nd largest, with a total enrollment of 904, including 491 boys. New Britain head coach Tebucky Jones was surprised to hear the rumors of a potential end to the Wishbone Bowl. The Wishbone Bowl, however, is more than just a game. It brings two neighboring communities together once year a week before Thanksgiving. Jones appreciates a good competitive game, especially with a border town. He said that tradition is important, especially when it comes to football. “Me, I’m a competitive person,” Jones said. “So when I see a good game, why would you want to stop playing a game that’s so great and competitive? It’s great for the two towns and half of the Veterans Stadium parking lot is in Berlin. Posted in New Britain Herald, Berlin, New Britain on Wednesday, 29 August 2018 20:42. Updated: Wednesday, 29 August 2018 20:44.